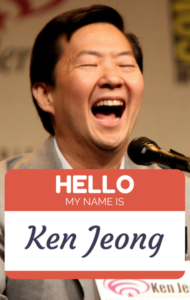 The world’s funniest doctor, Ken Jeong from Dr. Ken, was actually a doctor in real life, before playing the part of a Chinese mobster in The Hangover. There is no denying that Ken is absolutely hilarious and he even got his good friend, Dr. Oz, dancing as they made their way to their seats. Will Ken Jeong’s Daughter Zooey Be On Dr. Ken Again? On the other hand, Ken’s other daughter Alexa prefers to stay off camera and is interested in being an illustrator or producer. But for now, she is more interested in gymnastics and was even second in a Southern California state gymnastics competition. Dr. Oz joked that with both parents being doctors, one daughter is a gymnast and Ken added that the other is a burned out actress. Ken admitted to Dr. Oz that the latest season of Dr. Ken was a bit more personal but much more creatively gratifying. He shared that he has had more confidence as a writer to explore more family and emotional issues. If I’m physically naked on The Hangover movies, I’m more emotionally naked on my own show.